New With Tags is Still Preowned! I am not only an active seller, but an obsessed buyer on resale sites. Usually Poshmark, but sometimes eBay. I trust Poshmark more so I usually start there. As I was just scrolling through listings I felt the need to stop to write this post! YOUR OLD CLOTHES ARE NOT WORTH RETAIL PRICES!! Oh em geeeee! Seriously people, I don’t care if you paid $58.50 plus tax for that blazer at the store. It’s now preowned! If I wanted to pay anything over half the retail price I would buy it directly from the store. Because then I would have a 90 day return policy! I can hear you now, “But it still has tags on it! It’s brand new!” No it’s not. You’re not a wholesaler. You didn’t buy it directly from the manufacturer with the intention of a retail sale. Like it or not it’s preowned, it’s probably got some lint and dog fur on it, and possibly even fading! I had this conversation with my mother a few months ago. My parents bought me a brand new violin when I was 12. I ended up taking chorus instead of orchestra in middle school, so it’s been sitting unopened in my parents house since then. It’s now 21 years old! It can go to a bar! Ha! The point is my parents paid $500 for it. They got a $500 (allegedly) discount on it because we had rented one for a year (personally I think this was a great sales ploy). So my mom argued with me that this violin retails for $1000 and that that’s what we would sell it for. NOOOOO that’s not how it works! It’s preowned even if it’s never been used!! Not to mention age. This goes for your clothes with tags on it. You’ve had it in your closet for 3 years. It’s aged. Fabric deteriorates just like anything else. Those old underwear with the elastic waist band that no longer stretches but actually expands and the pieces of elastic break? Yeah, perfect example! When posting a preowned item age and condition need to be taken into consideration. I’m just saying it’s not worth retail. It’s only worth what someone will pay for it. 2 years have flown by! It’s been 2 years since I last posted a new blog. I was a little busy you could say. I got a full time job, got engaged, planned a wedding, got married, and boom had a baby! You know, the usual! I’ve been wanting to start blogging again. I even started a new blog that centers on my amazon reviews! After buying a million new baby items on amazon and reading reviews I learned about the amazon vine program. It’s now my goal to get that invite! I’ve raised (or lowered really) my amazon reviewer ranking from #400,000 something to #8,000 something! I’m super proud of this stupid accomplishment lol. Anyway, I’m restarting my blogging journey here at my core. I’m now also Tommy’s mommy though! So I’ll be sharing more than just my Poshmark tips. I have so much to share about having a baby and how different it is after 8 years and with a different husband. I think a lot of moms will be able to relate and hopefully feel understood. Can’t wait to share more! 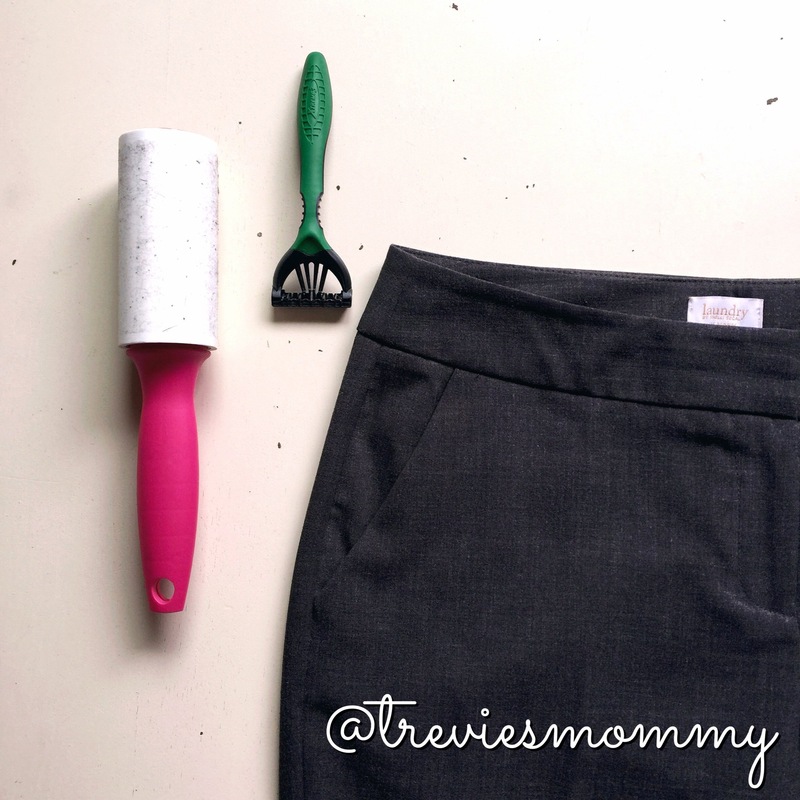 Clothing Resale Tip: I Shaved My Pants. Boyfriend: So, what did you do this morning? Me: I shaved my pants. Huh? Yes you read that right! 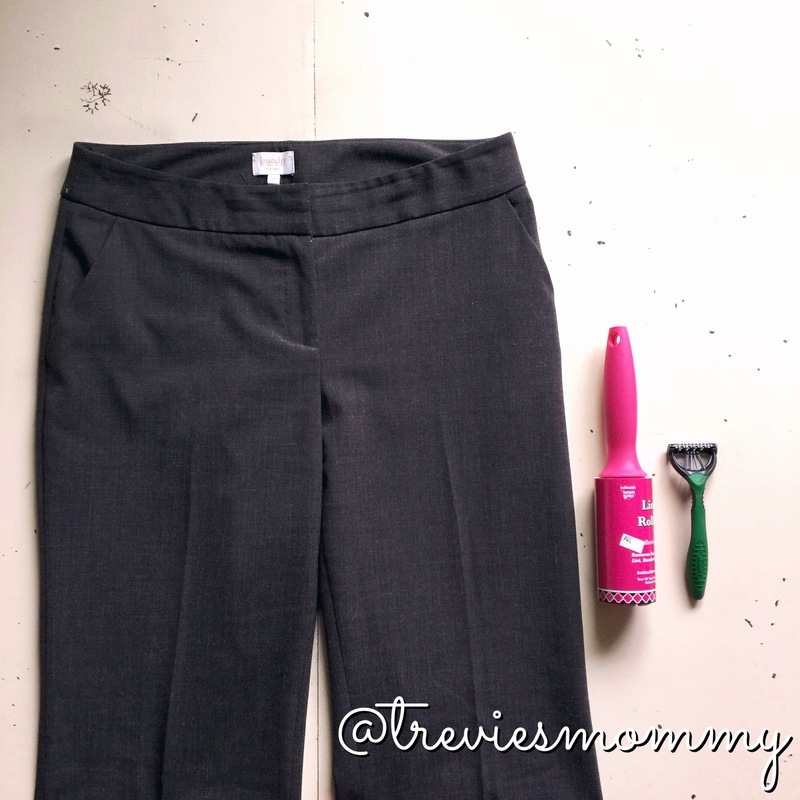 I shaved my pants! I know what you’re thinking, but I’m not crazy (ok maybe a little, just don’t ask my ex’s ok?). I’ve been so busy with taking pictures, writing descriptions, posting listings, and shipping orders that I haven’t posted anything here lately. I realized that yesterday when I got my new business cards in. So this morning when I grabbed the first item in my “needs to be photographed” pile, I gave the pants a glance and saw some minor pilling. Normally, I would just add that in to the description of the item’s condition, but then I remembered something so cool that I had heard. Shave them. Lightbulb came on for “perfect new blog post” in my head. So here we go! You will need so much, just kidding it’s only 3 things! The clothing item that has pilling. A brand NEW, never used, disposable razor. Yes new. You don’t want soap, rust, or little hairs on your clothes. Yuck. Clean flat surface. Ok I know I said 3 things but does this count? Technically does the item count? Is it only 2 things? Lay the item, mine was a pair of pants, flat on the table. 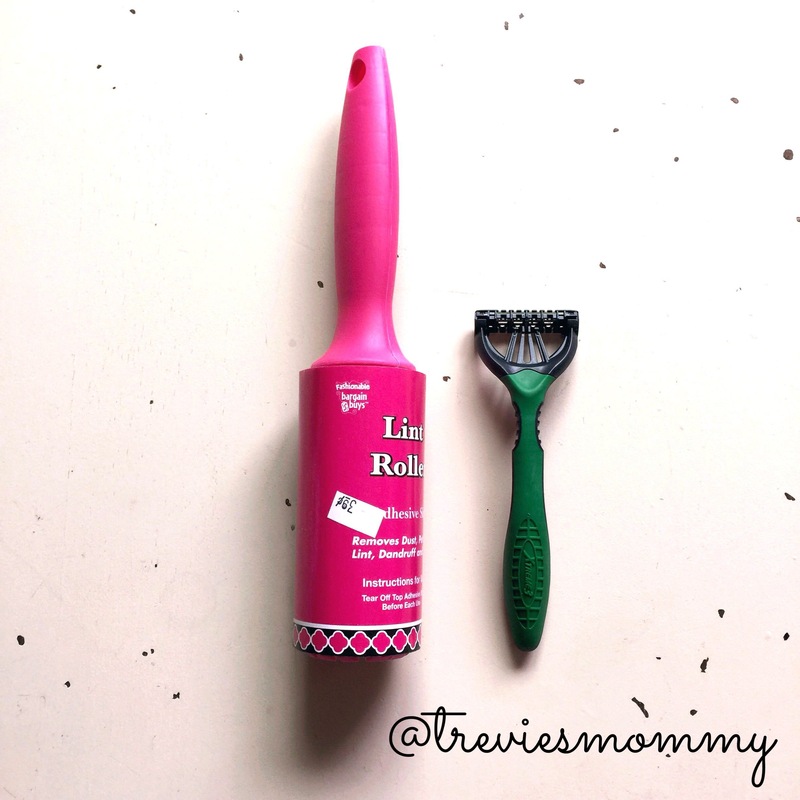 Lightly shave the fabric where you see the pilling (little gathered balls of fabric). Don’t be scared! Just start with light pressure and see how it goes, you can always add pressure if nothing is happening. 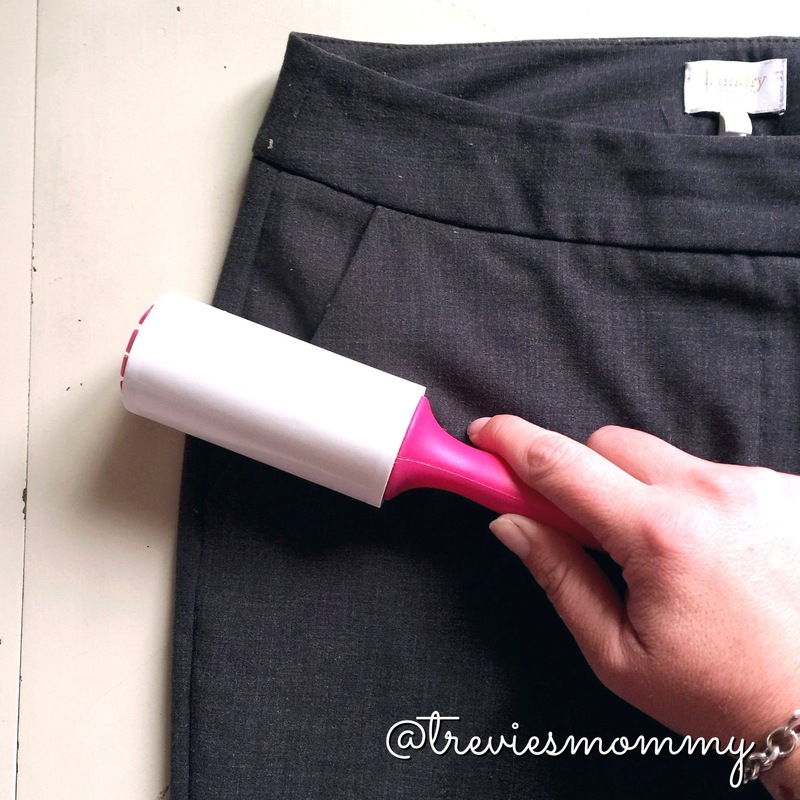 Take your lint roller and clean off those pesky pills! 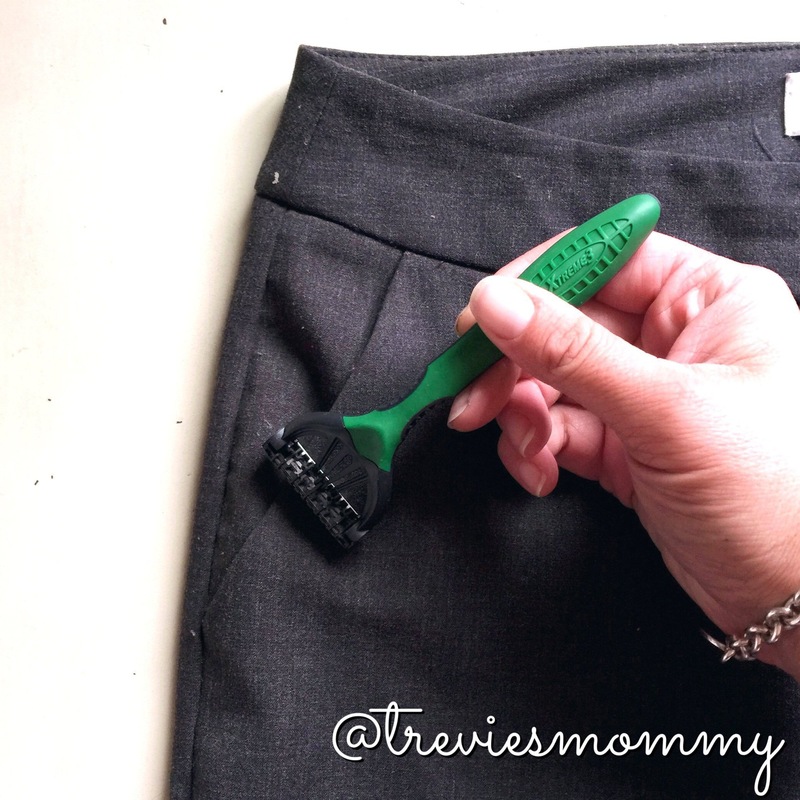 Brag about how you made your pants look new again! I hope this helps someone because it helped me! It’s actually pretty fun, and I felt good after. I know, it’s the little things! 1. Deep discount prices. You can literally pay $4 for a brand name pair of jeans. Don’t believe me? You can search and filter by ‘Sold’ and see what people are actually paying for things. Do you really need 4 more reasons?! 2. You’re money is supporting people like you. Some of us are trying to make a living by reselling clothes (my hand is raised), others are stay at home moms trying to supplement their household incomes, and some are just trying to save up for a nice vacation. No matter the reason, your purchase helps women and men just like you, trying to pay the bills, instead of huge corporations trying to impress shareholders. 3. You’re saving the planet. I’m guilty of this. You are over your life, so you start cleaning out your house. First stop is your closet and while you intend to donate your old clothes, at some point you’re sick of it all and throw them in the trash. They are off to the dump and will spend eternity in the landfill taking up space. I could go on and on about the carbon footprint you make by purchasing brand new clothes, but that would take a lot of research and I’m too lazy for that. 4. You’re supporting the U.S. Postal Service. Um hello, remember when email came around and the Post Office almost went bankrupt? 5. You can stay in bed watching The Bachelor in Paradise. You don’t have to go anywhere! And the stores never close! One of the most common questions customers have is, “Measurements?” The easiest way to avoid this is by listing the measurements when you list the item. When the item is pants or jeans the customer wants to know the inseam usually. I don’t do measurements unless someone asks, but I have started to at least measure the length or inseam of the item, so I can at least have that in the description. Here is a general guide on how to measure jeans or pants. Keep in mind that all measurements are done with the jeans laying on a flat surface and not stretched. 1. Waist: Measure flat across the back of the waistband from one side to the other (I always go left to right). Double the number to get actual waist size. This number will be different from the size of the jean because they don’t always sit at a woman’s natural waist. 2. Inseam: Measure from the crotch seam to the bottom of the leg on the inside seam. 3. Outseam: Measure from the outer bottom of the leg opening to the top outer of the waistband. 4. Leg Opening: Measure across the leg opening from side to side then double the number. 5. Front Rise: Measure from the crotch seam to the top of the front waistband. 6. Back Rise: Measure from the crotch seam to the top of the back waistband. 7. Hips: Measure the widest part of the item by the waist. Usually this is across the base of the zipper from edge to edge then double the number. To try and help everyone out, here is a guide I made of used clothing conditions. Enjoy! We all know that first impressions make lasting impressions, right? Well making sales online is no different. The first impression a potential customer has of you, is the first picture on a listing. That’s it. Bad pic= no sale. A good cover shot can not only sell that listing, but it can help sell it at a higher price, and if it grabs their attention they will go into your closet and possibly buy more from you! When I look back to when I first started selling things online, I’m embarrassed of how I used to post listings, and proud of how far I’ve come and how much I’ve learned (mostly through trial and error). Here are five things to help get you started! 1. Background. I’m putting this first because it sets the stage for everything that follows (however, I don’t think it’s as important as number 2). Think clean. Easiest choice is a white background. A white poster board, foam board, or even a flat white sheet are great inexpensive options that many pro’s use. If you just want to take a picture fast and not deal with an actual background, just please make sure there’s no clutter in the photo. I don’t need to see that pile of laundry on your floor, your vacuum cleaner, or that stack of bills you’re trying to pay for by selling this to me. 2. Lighting. Day light. Natural light. Honestly, this is the ONLY option for a clear, bright, and accurate photo unless you have PRO studio equipment. That $50 kit you got on Amazon is great, but it doesn’t compare to natural light. Trust me, I know the only time you have is at night to take pictures. I’m with you. I tried spotlights, new LED daylight bulbs, 5 lamps in one tiny room. You can not accurately show colors without natural light. You’ll spend an hour doing number 5 on each picture if you try to recreate natural lighting. Again, trust me because I did that! 3. The Rule of Three. The item you have for sale should be styled with two props that showcase your items beauty. Show the customer how you would wear that dress. Even if she wouldn’t wear that dress with those flats, you’re putting the idea in her head of what she thinks would look better (from her own closet) with your dress. 4. Props. I already suggested shoes, but there’s so many things you can use in your rule of three styling. Jewelry, flowers, notebooks, water bottles, or even better pair the top you’re selling with a pair of jeans and stilettos that you’re selling. Make sure to add in the description that the other items are also for sale in your closet! 5. Edit. Editing is an entire blog all on its own. I’ve used at least 6 different apps to edit my photos. The one I’m currently loving is PicsPlay. You do have to pay for extras like having their watermark removed from your pictures, but it’s an investment worth the money in my opinion. So those are my 5 basic tips to get you thinking about your cover photos. What would you add? I’d love to hear from you! Ok y’all this is some VERY exciting Poshmark news!! The ‘Offer’ button. Let’s talk about. I’ve read a lot of users complain about it. Obviously no one like a low baller. But do these users like sales? I personally LOVE the offer button. I started poshing after the offer button was introduced, so I don’t have any experience with using Poshmark without it. I’m a buyer almost as much as I am a seller on the app. Unless an item is $6 or under, I never hit the buy now button. I always make an offer. Depending on my current budget, if an item is listed at $25 I will offer anywhere between $15 and $20. If I offer $15 ($10 less than the listing price) I try to comment on the listing that I’m not trying to offend them with my offer, but that I love the item and that is what I can afford. I think it’s nice of me! I’ve only had a buyer do that for me one time. And even though I made $1.05 on the transaction, I accepted her offer because I understand! I’m usually broke, and when I’m feeling down my therapy is shopping (Yes I realize that I’m in a vicious cycle of feeling depressed, shopping, being broke, then being depressed because I’m broke. Thanks Mom). But getting something is exciting, can lift your spirits, and can make you feel beautiful! Also getting a great deal gives you a sort of high. So back to the offer button. As experienced Poshmark sellers, we know we will be getting low ball offers, and fair offers. We try to price accordingly. We add a few dollars to our listing price in anticipation of offers. Don’t get me wrong, the best feeling is to wake up to a full asking price sale! But don’t be afraid of offending a seller with a respectful offer of a few dollars less than their asking price. If they decline, you have the option of making another offer, or paying the list price. I started my resale journey on February 19, 2016. I’m about 5 months in and can’t even being to tell you how much I’ve learned. I started years ago selling things on Craigslist. I was mildly successful with selling big things from around the house. But I knew that clothing wouldn’t sell there. So after I lost my job in February, I started researching different sites. I’d been selling shoes sporadically on Tradesy for a few years. I’d sold a brand new wedding gown there. But it wasn’t a site that was very known. So I researched. In February I started with Totspot. Trevie had outgrown so much that my garage and his room were overflowing with boxes of old clothes. So I knew there was some money there. From Totspot I joined every other resale app that I could find. I was very reluctant to join Poshmark because it did not appeal to me. I thought it was for high end, designer clothing. Something I didn’t have and couldn’t afford to buy, even at used clothing prices. But I finally bit the bullet and signed up. Whoa. Life changing for me. I started posting everything I could find around my house to sell. I was listing on Poshmark, Totspot, Mercari, Tradesy, Vinted, eBay, OfferUp, and occasionally on Craigslist depending on the item. There is so much that has to be done for every single item that you list. It became much more than just snapping a picture and posting. In May, I got burnt out. I stopped posting anything, and if I had something sell I would cancel the sale because I did not even want to go through the process of wrapping, writing a thank you card, boxing it, and shipping. It was just too much for me at that point. I took a few weeks off, then in June I slowly started to Posh again. But that was it, and still is for the most part. I still occasionally post on Tradesy or Mercari depending on the item, but I’m staying focused on Poshmark and building my brand there. So why am I focused on Poshmark instead of one of the other sites that I was equally as successful on? Poshmark is a community. It’s a culture. I have made actual friends on there! It is women helping women. They are there when you get burnt out to tell you it’s ok. They are there when no one has bought anything all week to tell you it’s been a slow month for them too! We lift each other up and even pray for each other. No other resale site is remotely like this. If you are tempted to join one of these sites, but don’t know where to start, join Poshmark. You will gain so much by getting rid of your old stuff!